The Canvas Shop, LLC. has been in business for over 30 years and specializes in creating custom covers for many applications. We work with various materials including canvas, vinyl, webbing, clear vinyl, marine fabrics and mesh screen. Also,we carry tow straps and tie down straps as well. We are always looking for new products and striving for better quality to exceed our customer's satisfaction. Our goal is to provide you with quality products at a fair market price. Please call or stop in and find out what we have to offer you. Our main focus is creating custom covers and tarps for many product applications. To accomplish this work we use We are always looking for new products to bring to the marketplace that enhance what we do as well as strive for better quality and customer satisfaction. For pontoon and boat covers we use a material called Aqualon. Aqualon is a vinyl coated polyester canvas that is made here in the USA. Aqualon has excellent dimensional stability and weight-to-strength ratio. The material remains flexible in all climates and is resistant to mildew, abrasions, water penetration, most petroleum products, ultra - violet rays, as well as a wide range of acid and alkaline liquids. Aqualon comes with a 5 year warranty. On some boats we use HarborTime®, a marine grade fabric made from acrylic-coated polyester, ideal for harsh marine environments because it offers exceptional resistance to abrasion while maintaining superior strength and visual appeal. Harbor-Time® is highly water repellent and resistant to both mildew and ultraviolet light making it ideal for a wide range of marine and automotive applications, including bimini's, T-tops, mooring and travel covers, and splash curtains. We offer many colors in the materials we use to accomodate most requests. Also available are many different vinyls, canvas, screens, sunshades and much more! Our main focus is creating custom covers and tarps for many product applications. To accomplish this work we use vinyl, canvas, marine fabric, mesh, screen, clear vinyl and webbing materials. 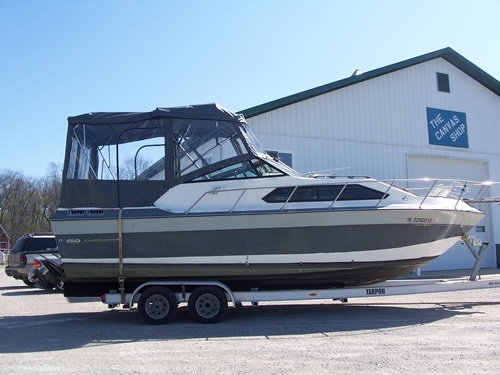 The Canvas Shop in Shipshe specializes in custom covers for boats, semis and trucks using various canvas and vinyl materials and marine fabrics.